It’s like there is an invisible connection between the two. I don’t have to remind her of the correct pencil grip, or to correct her posture, or that her feet should be positioned flat on the floor (instead of crossing her legs) or that her knees should be at 90 degrees. Once that puzzle for the week appears, all the peripherals fall into place like magic, she’s instantly ready to tuck into some good problem solving. It always surprises me how quickly a child of any school age from 4 years upwards can grasp this skill of solving Sudoku puzzles. It does not matter what the diagnosis is; dyslexia, dyscalculia, Asperger’s, dyspraxia… even dysgraphia (difficulties with handwriting and creating legible script) my students love them. What is so special about Sudoku puzzles that make them worthy from the therapist’s perspective? Are we empowering our children to think for themselves? The thing is, we are taking away thinking skills. Even Lego is prescriptive; you follow the instructions page by page to get to the end results. I mean this is good, but we need to be free at times. The fun of having a box with tons of LEGO pieces where you can construct the missing component needed for your play story has been swapped with bespoke themed LEGO, with pieces specifically for that themed box. The pieces of LEGO that make up ‘Star Wars: Millennium Falcon,’ may not be any good for the Batman cave…that’s another £250 of your hard earned cash. Unlike Monopoly or other board games you just need your Sudoku puzzle, a pencil and an eraser…that’s it, you can do anywhere. It’s just so straightforward, and you don’t need to be brilliant at maths either. Sudoku is a great way to make numbers or letters your child’s best friend. We need to nurture children’s understanding that there are many different ways of solving problems; to think critically and to make judgments on our own ways of thinking (meta cognition). The Sudoku puzzles open doors to so many possibilities of different types of thinking of doubts and of confidence until you come to the solution. Whilst crosswords have been around doing this job for ages, they serve those who are curious about spelling; they do not nurture those who find spelling challenging. Sudoku introduces safe problem solving and encourages children to be curious. Children who dislike maths think of numbers differently, and children with diagnosed problems such as dyscalculia actually make friends with numbers, and learn to fear them less. Below are steps we used with a child who had a fear of numbers and hated maths with a passion. We went from the first step to the fourth step in twelve weeks, completing three puzzles per week. Third step: Move to the next size grid six by six starting with simple puzzles and moving to more difficult ones in a given time span. 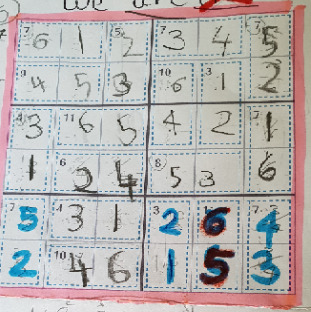 Forth step: Introduce ‘Killer’ Sudoku puzzles where the student needs to add and subtract. as well as the other strategies used to solve the puzzle.